Simplifying your imaging pipeline and your interfaces with intoPIX TICO & TICO-XS IP-cores. With the TICO technology, its standardization at JPEG (see JPEG-XS) and the release of new TICO IP-cores, intoPIX is accelerating the development of SoCs for next-generation mobile devices and displays requiring increased levels of quality and efficient reduction of bandwidth. 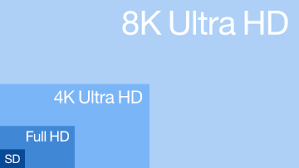 Higher display resolutions such as 8K and higher refresh rates are requiring a new advanced coding method (beyond technologies such as TICO SMPTE RDD35, VESA DSC 1.2, or other proprietary codecs) . For this reason, intoPIX has developed the new TICO coding profiles and new IP-cores called "TICO-XS", standardized at JPEG as JPEG-XS. Like the TICO standard (SMPTE RDD35) released in 2015, TICO-XS offers line based latency, lossless quality video compression to increase the effective bandwidth capacity of display links, reducing the number of lanes required, and therefore power consumption, system costs, and electromagnetic interference. intoPIX TICO and the new TICO-XS are highly optimized for mobile devices such as smartphones: the IP cores provide greater design flexibility for device manufacturers, and offer several unique features.